In our first installment, we addressed the general philosophy of the Sanders campaign and in the second, we covered the first four planks of Bernie’s Agenda for America. We’ll move right on to #5. For many people, this is one of THE most frustrating political conflicts, not because emotions run high the way they do concerning gay marriage or abortion, but because looking at individual business models that exist in real life is largely absent from the equation. Instead, the dialogue is dominated by talk of greed, fairness, and studies about what increases in the minimum wage have done in the past. Every person advocating for a policy such as this should look at it from the perspective of an individual business owner and how it would affect him or her and their employees. Every person advocating for a policy such as this should look at it from the perspective of an individual business owner. While there are plenty of people who believe the market should set wages, many do not object to some sort of minimum wage with increases indexed for inflation or cost of living. What is more popular is the idea of states, or especially local communities setting a minimum wage based on the cost of living in their area. A federal minimum wage mandates the same number for employers in areas where costs of living and operation are drastically different. There are a number of issues to address here. First, minimum wage earners are a tiny fraction of the workforce and their numbers are declining. In addition, about half of those work in the leisure and hospitality industry, mostly in restaurants and food service where they earn tips and commissions. Finally, and importantly, most are young, single, and lack a high school diploma. It should go without saying that education and the motivation to succeed will do more to ensure people aren’t living in poverty than raising the minimum wage. Second, while Bernie says that no one should live in poverty, the Department of Health and Human Services currently rates the federal poverty level for individuals at $11,770, excluding non-cash benefits such as food stamps and housing subsidies. A full-time minimum wage earner should gross $15,080 and net about $13,210 after Social Security and Medicare taxes. Not to imply that’s plenty, but the farther you get from the current minimum wage, the more current earners of $7.25 to $14.99/hour are above the poverty line already. 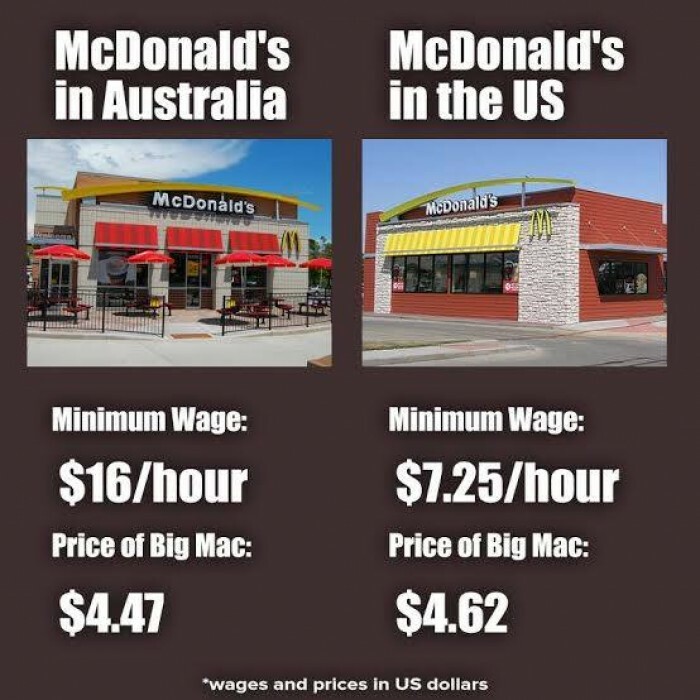 The current minimum wage down under is actually $17.29 (only $12.28 in U.S. dollars) and fast food workers have a national “award” somewhat comparable to a union contract which guarantees Level 1 workers about $19/hour ($13.50 U.S.). However, “junior workers” can be paid as little as 40% of the guaranteed wage starting at age 16, increasing by 10% until age 21 — so employees age 16 only earn about $5.40/hour U.S. The result of all this is that McDonald’s in Australia rely on younger workers in non-management positions and in addition, most of their cashier positions have been converted to kiosks. Finally, there is a wide variety of opinion what effect such a hike would have based on what has happened in the past with any increase. Some fiscal conservatives tend to predict doom and gloom while progressives anticipate a windfall for the working class. The reality needs to be addressed in the specifics, because each business has its own circumstances and broad generalizations aren’t helpful. Increases in the minimum wage have not had widespread dire effects but never has anyone suggested something so dramatic. The Department of Labor has a full page devoted to myth busting critiques of raising the minimum wage, but they are only talking about $10.10 to $12. Many of the endorsements are based on surveys, which doesn’t mean they are completely invalid but again, they don’t deal with specific business models. Further, the Congressional Budget Office did studies on even smaller increases to $9.00 and $10.10 and acknowledged, “some jobs for low-wage workers would probably be eliminated, the income of most workers who became jobless would fall substantially, and the share of low-wage workers who were employed would probably fall slightly,” all due to a much smaller increase. Foregoing inexact comparisons to look at real business models, we can focus on small businesses, which makes up 99.7 percent of U.S. employers. As an example, take an actual retail franchise with over 150 stores that aims for owner profit to be 20%, from which the owner must compensate himself and pay off any loans. Cost of labor is also around 20% and many part-timers in high school or college may start in the $8-9 range. In the long run, it seems increases are reasonable but $15 is likely to have adverse effects. On gross sales of $500,000, the owner expects a profit of $100K to pay himself and any debt — not poverty, but hardly a king’s ransom for a 60+ hour workweek and supporting a family. He has fixed costs such as rent. If he is forced to nearly double his labor costs, where does the money come from? The pie is not any bigger; the slices have simply been cut into different sizes. If he raises prices to attempt to increase income, can he remain competitive? Does he reduce advertising, which might hurts sales? Does he take it out of his own pay? Ultimately, most owners acknowledge that they will have to reduce hours and hurt the very people this was designed to help. Further, if other businesses have to raise prices as well, it reduces the effects of the wage increase and hurts people on fixed income. There are many variables to consider, but one thing to avoid is making assumptions about who will be hurt and who won’t. While it’s not uncommon to hear people say that any business that can’t pay workers a living wage shouldn’t be in business at all, few who make such claims are in the position of having to make such a choice. In the long run, it seems increases are reasonable, but $15 is likely to have adverse effects, particularly on young people. And of course, it’s curious that Senator Sanders only pays his interns $12. In 2014, Congress rejected the Paycheck Fairness Act, an attempt to address alleged discrimination and some felt the GOP’s “no” vote indicated they oppose equal pay. Republicans argued existing laws offer sufficient protections and the proposed legislation would not solve discrimination; rather, it would be a gift to trial lawyers while adding unnecessary burdens to business while hurting those it was designed to help. There is no one credible who doesn’t believe women should receive equal pay for equal work. The argument has always been about the accuracy of the statistics and whether additional laws will help. The argument has always been about the accuracy of the statistics and whether additional laws will help. When President Obama said women earn only 77% for doing the same work as men, his claim was rated “mostly false” because it didn’t “factor in occupations held, hours worked or length of tenure.” In fact, when the Bureau of Labor Statistics measured hourly wages, women earned 87% and it varied widely by occupation. However, when he revised his claim to say that women earn .77 to each dollar a man earns, that was rated “mostly true.” Why? Because “it refers to the average disparity between what men and women earn, period.” In other words, women only earn 77% for any number of reasons including working less. California may also be an opportunity to evaluate legislation. As Sarah Ketterer reports in the Wall Street Journal, Governor Jerry Brown is about to sign the California Fair Pay Act, a state law similar to the one Congress rejected. In sum, in looking at anything that appears to be a way of ensuring economic justice, we should be mindful of making an accurate evaluation of the problem and unintended consequences of proposed legislative attempts to rectify.